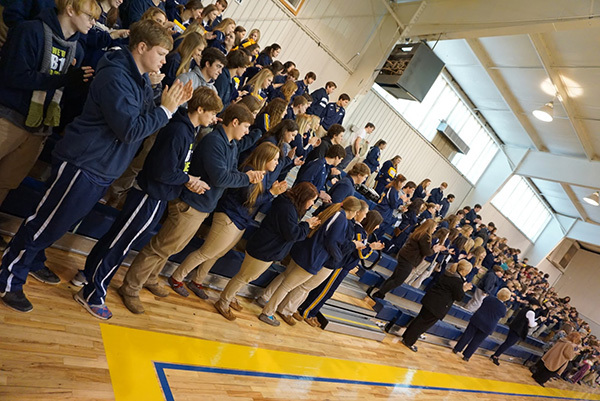 For Patrician Academy educator Debra Mosley, becoming a school teacher was a calling from God. During high school, Mosley was a kindergarten teacher's aide and loved it. However, she was unsure of what she wanted to do after graduation. Shortly after completing her education, Mosley was offered a job as a kindergarten teacher by the school's principal. From there, her journey began. 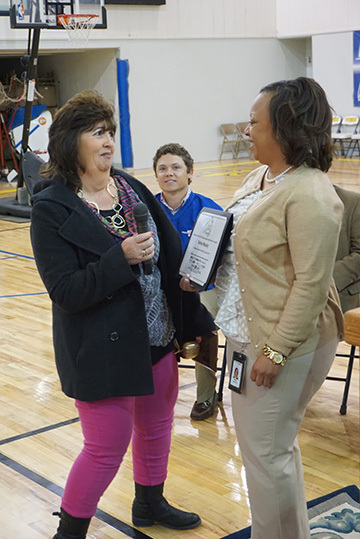 That journey reached a high point this week when, after 28 years as an educator, the Patrician Academy Elementary School teacher was named January's Golden Apple Teacher at a surprise ceremony. When the school's band started playing "When the Saints go Marching In," Mosley said she was waiting to hear someone else's name called. "I was expecting someone else because I work with the best, and have a lot of co-workers that I would share this award with," she said. "I don't feel deserving of this on my own, because it takes a community." The school's headmaster Billy Burnham said Mosley is very deserving. "She combines a love of children and a love of education to become a great teacher," Burnham said. 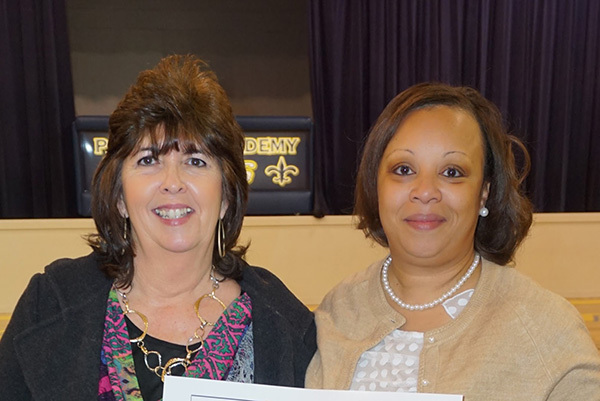 "She is also a mentor to all our younger teachers, and helps them to succeed. "We are very proud. 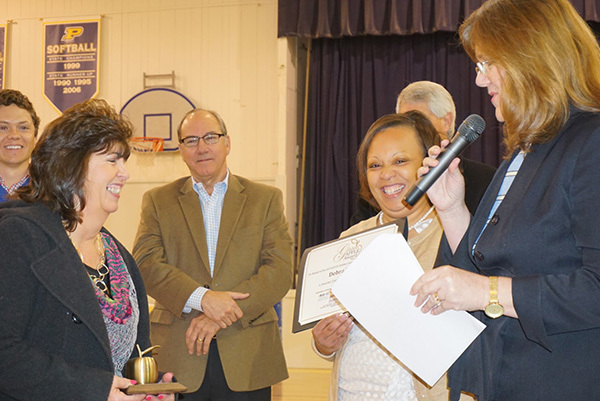 Proud that she is not only Patrician's first Golden Apple Award winner, but the first one the group has acknowledged in the state of Alabama." 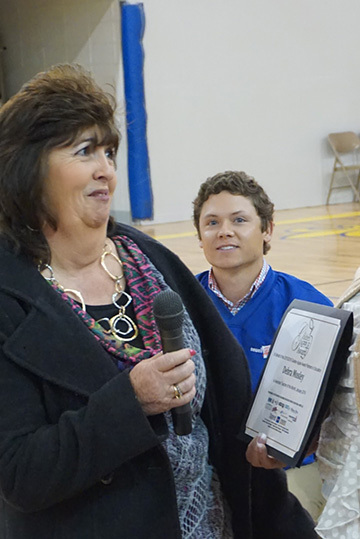 For Mosley, it was special to be joined by her family at the award ceremony. "It meant everything to have them there, especially my mama," she said. "She was the first one I really saw, and it made me feel good to share it with my mom. My husband Jimmy, my two girls, my grandchildren — God has blessed me with a wonderful family." During her years as an educator, Mosley has taught kindergarten, as well as first, second and third grades. 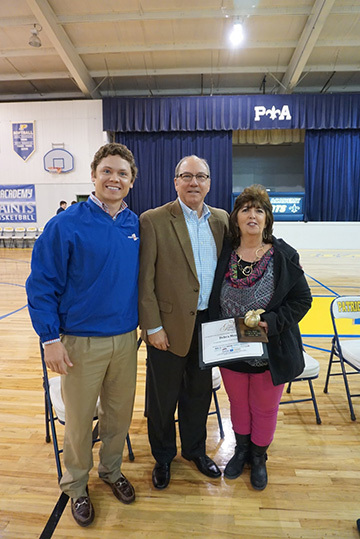 She taught at South Choctaw Academy for 10 years before taking the job at Patrician. She said her favorite part of the job is teaching reading. "It has always been my favorite," Mosley said. "When I was teaching kindergarten, that moment that they read and realized they were reading and that light went off, that was my joy. Still today, that is my biggest joy to see children reading, and getting involved in their books. "My goal each year is to try to get them to enjoy what they read. Not just to read for information, but to enjoy reading," Mosley said. "If children can read, they can expand on anything." Her advice for new teachers: start off tough, let the students know who is in charge, but let them know you love them. That's what I have done since day one and share with everyone. You have to be their teacher, not their friend; but let them know you love them, put them first, that is my philosophy." Third-grade students Gabby Newton and Matthew Mize both said they were excited their teacher won. "I think she is a good teacher because she is fair and she will answer everyone's questions," Newton said. "She is a great teacher because she teaches me how to do multiplication facts and I am proud of her for winning," Mize said. In her nearly three decades of teaching, Mosley has seen a lot of changes in the field. But one stands out as the most important. "Technology has changed so much, but being able to communicate with the parents has been the biggest plus with technology," Mosley said. "I can share information and the students grades with the parents by e-mail, and that is a plus." And she enjoys working at Patrician Academy. "Being a smaller school, you can give that one-on-one attention to your children, and feel more comfortable calling on the parents for help," Mosley said. "This is all I have ever known working in an academy. I know this is where God led me. I was able to be here with my children and now my grandchildren. It can't get any better than that." As to whether she will retire soon ... That's something Mosley says is left up to God. "In six years my grandson will graduate, and that is my goal," she said. "I will be 65 when he graduates. If that's when God says it's enough then, so be it. If it's not and I am in good health, who knows what God has in store." Mosley and her husband of 37 years, Jimmy, have two children, Misty and Mandy, and four grandchildren: Scott, Allieanna, Ashlyn and Kelsey. 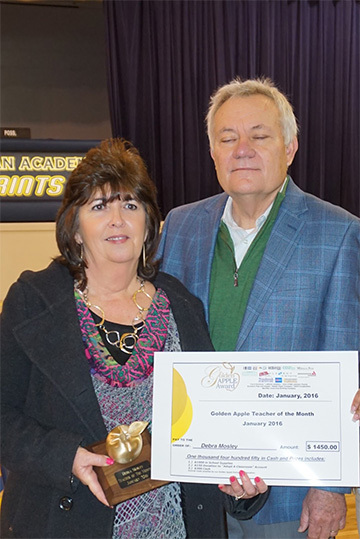 As a Golden Apple winner, Mosley received a $300 cash prize, a Golden Apple Trophy, a $150 donation to an "Adopt a Classroom" account and a large school supply donation for her classroom. 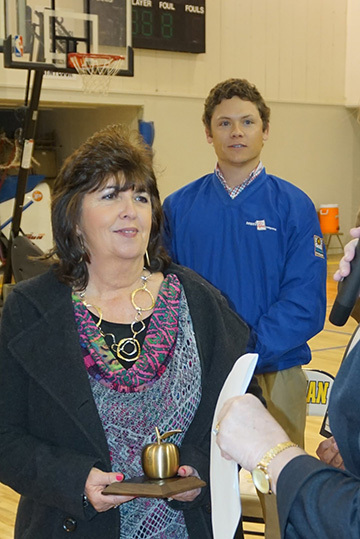 The monthly winners will be invited to the Golden Apple Teacher of the Year banquet and that winner will receive $2,500 cash to be used at their discretion, and a $2,500 scholarship to be awarded to a deserving student in the teacher's name. 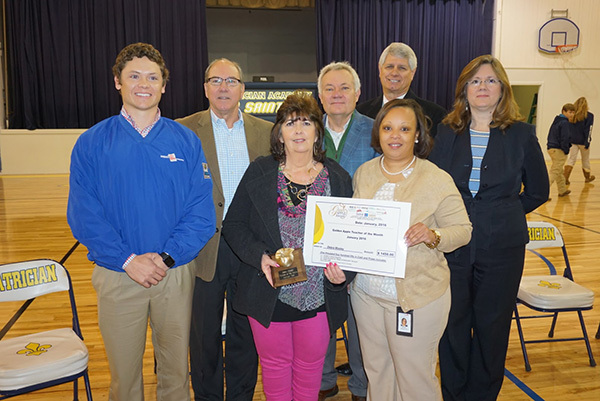 Mississippi Power Company is the January Presenting Partner. 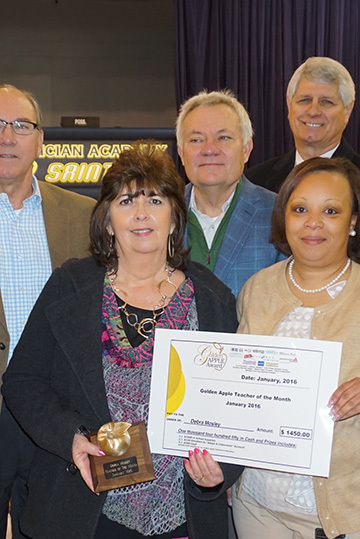 The Golden Apple Award is open to any educator, grades kindergarten through 12th grade who works in the following areas: Lauderdale, Neshoba, Kemper, Clarke, and Newton counties in Mississippi, or Choctaw and Sumter counties in Alabama.